There is a day coming when we will have so many cucumbers our counter will be overflowing, we'll eat them at every meal, we'll run them through the Breville with all our other garden greens and root vegetables for hundreds of glasses of juice, we'll use that same juicer to make gallons of fresh cucumber lime water, and late at night Jim and I will turn that water into icy "mojitos" just for us. Eventually we'll try to give you armloads of them every time you come over, and digress to throwing them at people we don't like. Those days are coming, but they're not here yet. We just pulled our first five cucumbers this morning. They're still elusive, you've got to dig for them. Each and every one is a precious jewel. 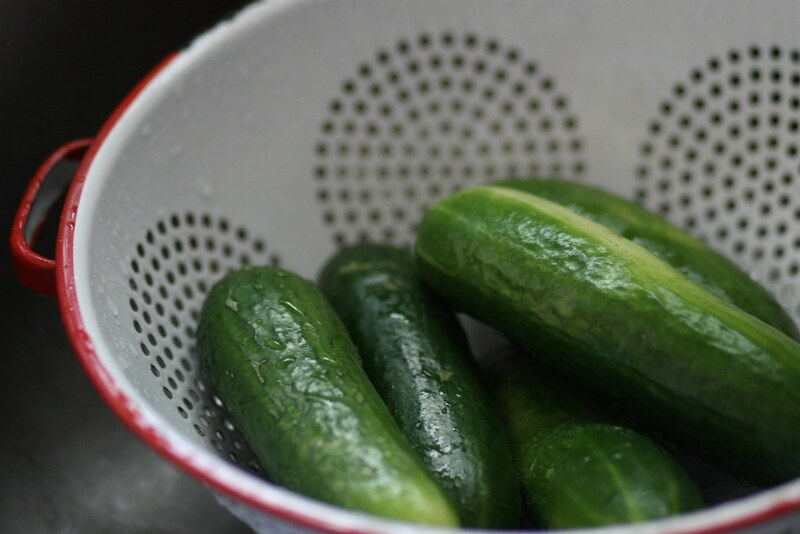 As we searched, Hudson and Lily ready with the colander, they discussed all the things we could make with them, Hudson saying at least a dozen times, "I love cucumbers, I love cucumbers SO MUCH." Since they're still such a precious commodity, we ate them in one of their simplest, easiest forms: tossed with what we had on hand for a quick lunch. 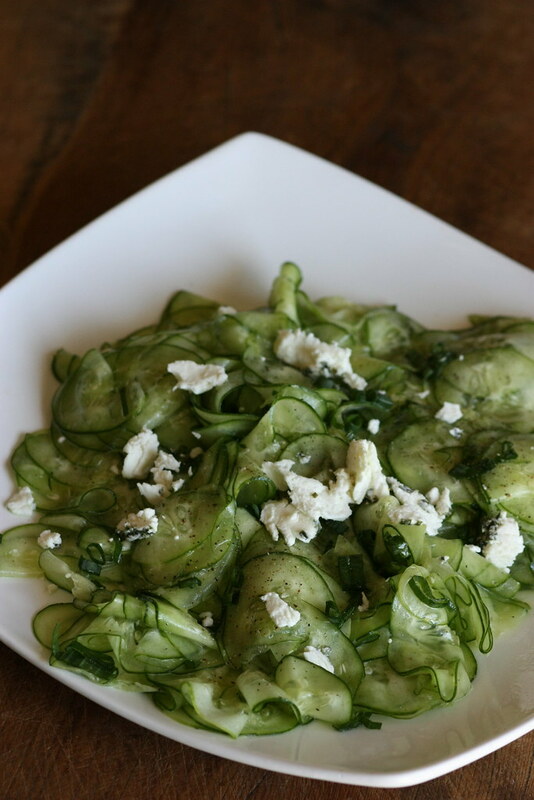 Cucumbers are so versatile, you can do so many things with them. But they're always better fresh and freshly sliced, better when combined with other simple summer staples from the garden. Today I poured about 1 Tablespoon good EVOO in a small bowl and to that I added a couple drops of lemon juice, half a clove of minced garlic, and some sea salt. I sliced three cucumbers using my mandoline, then added one stalk of sliced scallion. I drizzled the oil mixture over the top and tossed to combine. I finished with some crumbles of goat cheese and chives. Salt and pepper to taste, and we were done. Some kalamata olives would have made this. Chopped bell peppers or fresh tomatoes would have been great too. It would have been amazing with some hummus and crusty bread or pita chips (see this recipe.) Because they're so light and cooling, cucumbers are also nice paired with bold spices or hot peppers. Here's another combination you might want to try. The kids ate it immediately, four forks and they shared the plate. Each one had a banana and then everyone decided they were full. Half of us were still in our pajamas, and we accidently ate lunch an hour late. That's summer.